Every winner has a coach, and every coach has a philosophy. The ASLAN Other-Centered® Leader Coaches Quiz matches your coaching style with some of the legendary coaches in sports. Here is a deeper look inside the philosophy of one of the best. 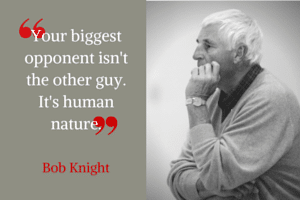 Bob Knight was the men’s basketball coach of the Indiana Hoosiers for 29 years. He also coached at Army and Texas Tech. He held the record for most wins of any NCAA coach with 902 until his former player and assistant coach Mike Krzyzewski broke it after Knight’s retirement. Knight also coached the 1984 men’s U. S. Olympic basketball team to a gold medal. Although Knight was best known for his fiery temper on and off the court, his coaching style revealed him to be a man of strategy who could often figure out the best way to win. He popularized the motion offense, which relied on passing the ball around until a player gets an open shot they are likely to make. He kept his plays simple and few, but made sure players knew and practiced them until they could do them with few mistakes. In his book titled The Power of Negative Thinking, Knight reveals that part of the reason for his success is that he thinks about things that can go wrong, then decides how to handle them so that they don’t. This strategy can prevent mistakes and problems, which can lead to more success. Sales coaching also involves strategy. Deciding what skills to teach sales reps, positioning them for success, and making sure they have the tools they need to succeed are all important parts of the coaching process. Teaching sales strategies to reps can lead them to a greater understanding of their part in the process as well. This excerpt from the ASLAN Training whitepaper “Learn Skills & Strategy to Access Decision Makers” talks about ASLAN’s strategy for helping sales teams become more successful. » Cut through the clutter – by creating a Unique Positioning Strategy (UPS) that gets attention and gets a response. » Find a path to the Decision-Maker – by developing a Relational Map or creating a more effective direct access strategy (e.g., email, telephone). » Quickly filter through prospects – to rank opportunities/accounts and ensure the most strategic approach to the territory (“site fish”, “troll”, or ignore). » Once you’re in, stay in – by learning a five-step account development process that links to the Decision-Maker’s pain and offers immediate value to the organization. » Find out who has the real influence, regardless of title – by learning how to identify the hidden political structure in any organization. » Get past the “big four” – successfully navigate the four main barriers organizations build to keep you out. » Engage even the most resistant Decision-Makers – by neutralizing their five most common (but false) objections to meeting with a sales rep.
» Map your path – using a simple tool to assess existing contacts and build a Relational Map to the Decision-Maker. Like Coach Knight’s players, your sales reps have a great chance of success through use of strategy and proven skills to guide them along the way. 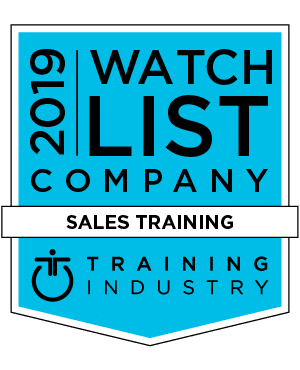 Download the entire whitepaper and contact us at ASLAN Training to hear more about our sales training programs customized to your company’s specific needs.